Candles at a local Target Store. You can’t be in Los Angeles very long before you bump into the iconic image of Our Lady of Guadalupe. Or at least, that’s the way it used to be. The stretch of Pasadena Freeway Highway 110 that I travel frequently between Pasadena and Los Angeles was for years home to a particularly large and garish mural painted on the side of a building along a frontage road, with only a raw chain link fence separating God’s Mother and the merciless humanity that flowed by each day. 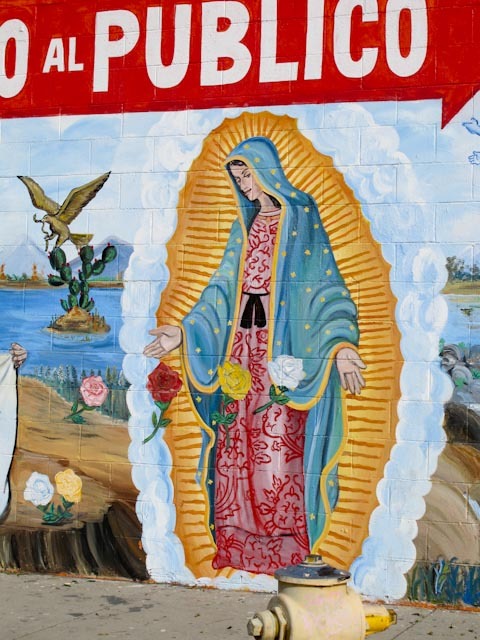 When I decided to write this article for The Catholic Gene on Our Lady of Guadalupe in Los Angeles, I thought I would have no problem locating the freeway virgin and several other popular renditions. Alas, times change. Freeway improvements and a new sound wall now obscure sections of neighborhood streets. I’ve lost Our Lady somewhere between Highland Park and Dodger Stadium. Angelenos’ affection for Our Lady of Guadalupe is one of the oldest traditions in our rather recent history, with roots in the desert near Mexico City. On his way to Mass on December 9, 1531, an Indian peasant named Juan Diego was passing near Tepeyac when he heard music and saw a vision of a beautiful young woman. She spoke to him in his own language, identifying herself as the Virgin Mary, and expressed her wish that a shrine be built at the place she appeared. She told Juan Diego to go to the Bishop in Mexico City and share the story of the vision and her wishes for a chapel. Juan Diego was unable to persuade the Bishop of the truth of his story, and returned to the hill where he saw the Virgin a second time. She told him to return to the Bishop, who then asked Juan Diego to bring him a sign from the Lady. Then, life intervened. Juan Diego’s uncle became seriously ill and Juan Diego was unable returned to Tepeyac until December 12. What he saw must have been truly astounding. The lady waited for him and assured him that his uncle would recover. When she heard the Bishop’s request for a sign, she directed Juan Diego to the summit of the hill where he found a wealth of fresh flowers in an area where they had never been known to grow. He gathered the blooms in his cloak and carried the bundle to the Bishop. But, when Juan Diego opened his cloak to show the Bishop the flowers sent as a sign from the lady, the surprise was not the blossoms as much the colored image of the Virgin depicted exactly as Juan Diego had described her. The image itself bore a striking resemblance to an Indian woman, not a European or Spaniard, with symbolism that would have been familiar to 16th century Aztecs. Blue referenced divinity and the gods; the rays of the sun emanating from her figure indicate her superiority to the great sun god; she stands on the moon, and hence the moon god. Her rose-covered dress would have been worn by an Aztec princess. The Image of Our Lady of Guadalupe as she appeared on Juan Diego's cloak. By appearing to Juan Diego, an Indian convert to Catholicism, Our Lady of Guadalupe became the rally-cry and devotion for millions of native people ready to turn away from the cruel Aztec religion to a loving and accepting deity. Her insistence that an Indian convert should act as her messenger sent a powerful message to the disenfranchised natives of Mexico. Our Lady of Guadalupe continues to inspire devotion throughout the world, especially in the Americas. 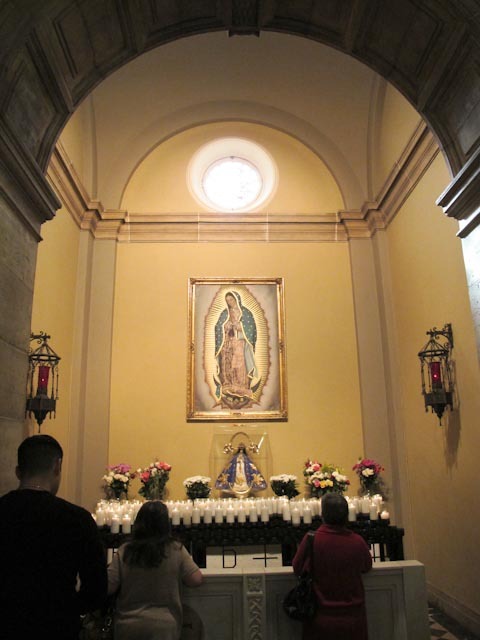 The image is now displayed behind the altar at La Basilica de la Nuestra Señora de Guadalupe in what is now La Villa, Mexico City. 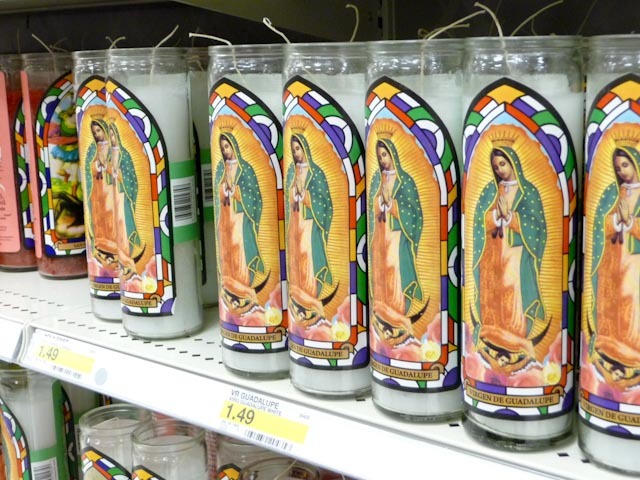 Closer to home, at least to me in Pasadena, California, Our Lady of Guadalupe is everywhere. Not surprisingly, she is the patron saint of “little businesses” and often found adorning corner markets in the barrio. Her image on bumper stickers guards the family car, on skin speaks of commitment, and in front-lawn shrines shares devotion. Our Lady is the friend of the underdog, the alienated, and according to an article by Judith Dupre, this modern Virgin Mary has become the symbol of gangsters, pro-lifers, and artists. Last Sunday after Mass I recruited my husband to join me on a pilgrimage of sorts – to see if we could find those neighborhood icons of Our Lady of Guadalupe that keep flashing through my memory. Our Lady of Guadalupe chapel at St. Andrew Church in Old Pasadena. I said a prayer in the Our Lady of Guadalupe chapel in our church, St. Andrew in Old Pasadena, and we headed out on our quest. We had no luck along the freeway frontage roads. We cruised Hispanic neighborhoods without success. But after a burger-break in nearby Eagle Rock, Our Lady smiled. 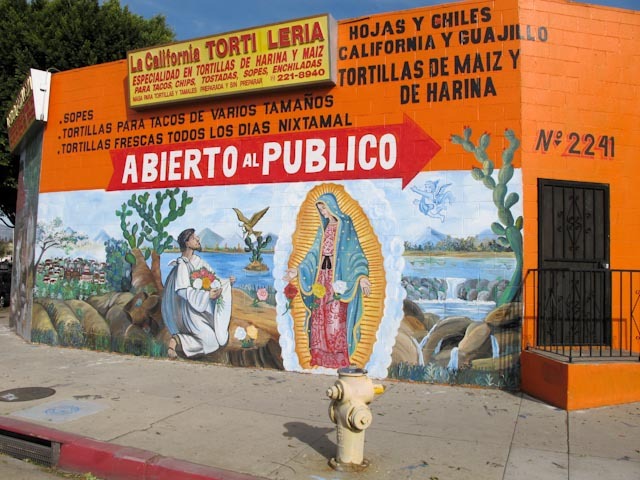 Our Lady adorns a tortilla factory in Eagle Rock, near Los Angeles. 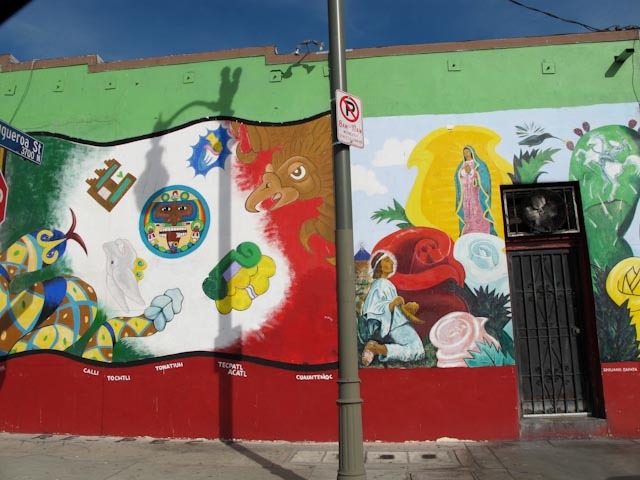 Side of restaurant building with mural of Aztec symbols and Juan Diego kneeling before vision of Our Lady. Leave it to Hollywood to redefine an obscure religious holiday as a cultural extravaganza. Dia de Los Muertos, Day of the Dead, is growing in popularity among Latinos everywhere, but Los Angeles and Hollywood have added their own special spin to the celebration since 1999 when this holiday took on new life at Hollywood Forever cemetery. For genealogists who customarily stroll city cemeteries on a quiet afternoon, Hollywood Forever will be a startling change on Saturday, October 22 when the L.A. Day of the Dead takes place on the grounds of the city’s oldest memorial park. Dia de Los Muertos is celebrated on November 2nd by Latinos in Central and South American, Mexico, and throughout the United States. The holiday has its roots in ancient Mayan and Aztecan tradition evolving through Roman Catholic influence to become today’s modern Day of the Dead celebration. Pre-Columbian Mexicans believed that the deceased continued to exist after death, resting placidly in Mictlan, the land of the dead. On one day each year, these departed souls were allowed to return home to visit friends and family. When Europeans arrived in Central American, they confronted this theology by adapting it to the Roman Catholic All Souls’ Day. 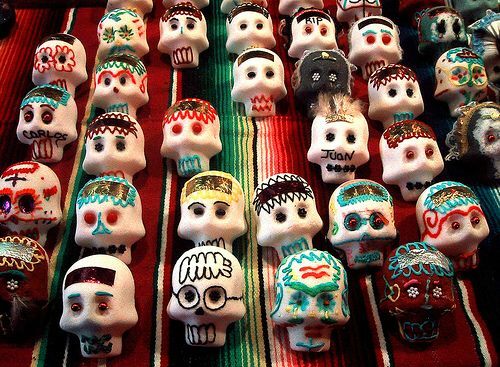 Today, Day of the Dead, is an official Roman Catholic holiday celebrated November 2. Celebrations vary by region, but typically include special foods, especially those favored by the departed, altars or shrines built in memory of the departed, sugar candy skulls, Pan de Muerto (Bread of the Dead), and tissue paper banners. 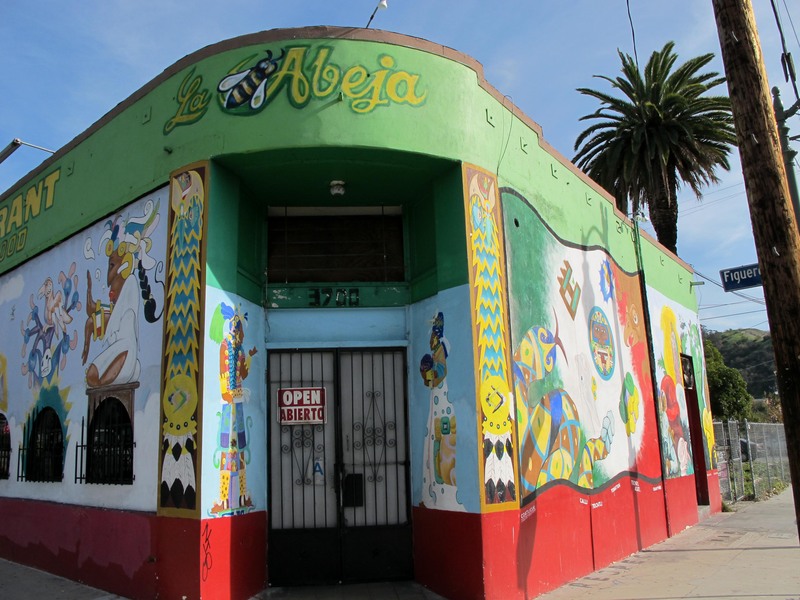 Los Angeles Dia de Los Muertos will be held this Saturday, 22 October on the grounds of Hollywood Forever Memorial Park from 12 noon until 12 midnight and feature performances by Astrid Hadad and Ruben Albarran. Tickets are $10 per person. Highlights of the event include parades, food, music, theater performances, and viewing of the altars. Prizes are awarded for the Altar Decorating Contest – 1st prize $3000, 2nd prize $2000, 3rd prize $1000. I’ve just returned home from the Louise M. Davies Symphony Hall in San Francisco where maestro James Conlon conducted the San Francisco Symphony in a performance of Giuseppe Verdi’s Messa da Requiem (Mass for the Dead). As I’ve usually done when attending performances at Davies Symphony Hall, I arrived an hour early for the concert, scheduled to begin at 8 PM Pacific Daylight Time. My early arrival allowed me to attend a pre-concert lecture about the Requiem presented by James Keller, the program annotator for the San Francisco Symphony. SOURCE: User:Leonard G, Davies Hall Interior Panorama (http://tinyurl.com/4xqjly8 : accessed 20 October 2011). The Requiem is performed by orchestra, a double choir, and four soloists. Soloists in tonight’s performance were Sondra Radvanovsky (soprano), Dolora Zajick (mezzo-soprano), Frank Lopardo (tenor), and Ain Anger (bass). I had heard Ain Anger in a previous concert and was pleased to be able to hear him perform again, at least partly because he originates from Estonia. You see, I visited Estonia last year and memories of that country’s beautiful capital city of Tallinn were still relatively fresh in my mind. Estonia has incredible traditions in music and so I wasn’t surprised to learn that Ain Anger was from Estonia or that he had trained his voice in Tallinn. Furthermore, my maternal grandmother was born in what is now Lithuania, and I feel a connection, however tenuous, with other people from the Baltic States. The Requiem is a towering choral piece, one that all people should hear at least once in their lives. Listening to a recording of the Requiem is just fine, but hearing the piece performed live is divinely inspiring. The Requiem is divided into seven sections, many of which correspond directly to parts of the Catholic Mass. After all, Verdi created this work as a Mass for the Dead. The concert was scheduled to begin at 8 PM and, usually, the concerts of the San Francisco Symphony begin precisely on time. Tonight, the performance began about 6 minutes late. Curious, I wondered why. I shook my head, uncertain. I settled in my seat to enjoy the concert. Then, at 8:16 PM, about 10 minutes into the performance, I suddenly felt a sharp jolt to my side and, at first, I thought that someone had vigorously kicked my seat. A second or two later, I noticed that the lighting in the hall somehow seemed to shift. I allowed my gaze to move up and I observed that the fixtures high above my head, hanging from the lofty ceiling on narrow cables, were gently swaying to and fro. I realized that the jolt had not been a kick to my seat. It had been an earthquake. Looking around, I could sense that the other patrons in the Symphony Hall had come to the same conclusion. Nonetheless, the orchestra, chorus, soloists, and conductor, all professionals, continued the concert as if nothing had happened. After a few minutes with slightly jangled nerves, I settled comfortably back into my seat, absorbed once again in the concert, enjoying the music. Following the words to the Requiem (my mind moving back and forth between the Latin that was being sung and the English translation in the program), I was thoroughly absorbed in the performance. Libera me, Domine, de morte aeterna, in die illa tremenda quando coeli movendi sunt et terra; dum veneris judicare saeculum per ignem. Deliver me, oh Lord, from eternal death in that awful day when the heavens and the earth shall be moved; when you will come to judge the world by fire. The heavens and the earth shall be moved, indeed! With the ceiling fixtures moving above me and my seat shifting below me, should I now prepare myself for heavenly fire? At the time I felt this earthquake, I had not been aware that the movement I felt was, in reality, the second earthquake originating from the same location today. The epicenter of both of the two earthquakes was 1 mile east of Berkeley, about 12 miles from the Davies Symphony Hall where the Requiem was being performed. The first temblor, a 4.0 magnitude quake, struck at 2:41 this afternoon. I was at work in Palo Alto at the time and did not feel this earlier upheaval. Nor had I even been aware of it. The quake I felt at 8:16 this evening was of magnitude 3.8, and it was shocking enough by itself. These two events were, fortunately, both minor quakes. I have not yet heard that either of them caused any damage. And, when I returned here to my home this evening, I found everything in order. God is still in His Heaven. All is still right with the world. I was brought up within the folds of a fundamentalist Baptist church, but regularly attended Roman Catholic Mass. My Girl Scout leader had some sort of pact with the parents of Catholic Scouts: the girls could join the troop for weekend campouts, if they could get to Mass on Saturday night. So I went too. We sat in the front pews of little mountain churches listening to the Latin inside and the wind in the pines outside. It was warm and dry compared to the wild weather we faced at our campsite. I rather liked going to Mass. I thought my friend Anne might reciprocate by coming to church with me some Sunday morning after a sleepover, but the suggestion was quickly set aside. For some reason, she simply wasn’t allowed to go to a Baptist church. It was a sin or something. She probably wouldn’t have liked it much, anyway. After all, for her Mass lasted an hour, tops. For us, Church included an hour of Sunday School, twenty minutes “recess,” and then a worship service that was considered “short” at 60 minutes. The typical Sunday morning began with a scramble to eat breakfast, get dressed and get to Church with time to spare. 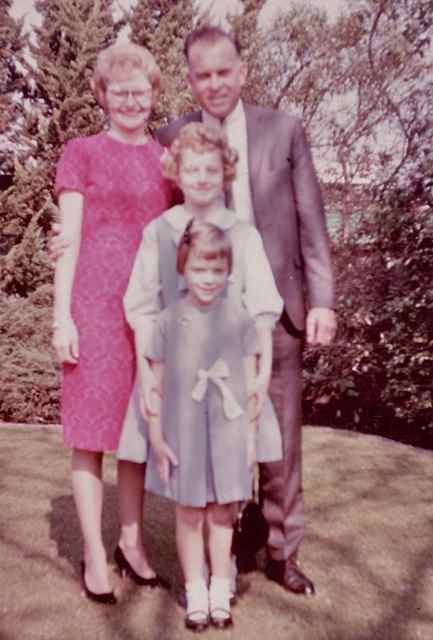 Proper church attire was a dress for the moms and girls, suit and tie for the men. Grandmother added a hat and gloves; grandpa wore a hat. Shoes were polished on Saturday evening and left to dry overnight on a stack of newspapers. We never walked in after the service started. One Sunday we drove up in front of the church a few minutes late. The doors were closed, the steps empty. My dad spun our Chevy Impala in a classy U-turn and we went home to spend the day quietly until we went back for the evening service. Twenty years later I noticed that my mother-in-law had no such compunctions about tardiness for Mass; any time before the sermon was fine by her. Unlike most Catholic churches that seem to last for decades if not centuries, many protestant churches change or disappear with each passing generation. My old church, Bethany Baptist of Whittier, California, merged with nearby congregations in the mid-1970’s. Today, the property is home to the vibrant Zoe Christian Fellowship who worships in word, song, and dance. This short film shows that the main sanctuary hasn’t changed much since I attended in the 1960’s and 70’s, except for the addition of the big-screen monitors. A typical Sunday in our Baptist family included Sunday School and Worship Service in the morning, followed by the evening service. This was a more relaxed meeting, often featuring special music, a religious film, or a talk by missionaries. The missionary talks were incredible. Earnest men told stories about facing hostile natives in the South American jungle or saving orphans in China. Our congregation supported several missionary families all over the world; they had to be gifted speakers, the collection plate was their paycheck. It wasn’t only the service that was different from Catholic Mass. The pews were all comfy padded benches, the better to keep you in your seat for those two-hour services. And, your feet were unrestricted by kneeling benches. Baptists didn’t kneel in church. Even the wooden hymnal racks were different, sporting little round cut-outs for the communion cups (Communion = Holy Eucharist in Baptist-speak). We only used those tiny glass cups once a month for the regular communion ritual, the symbolic sharing of the Last Supper. The first time my cradle-Catholic husband was present for Communion Sunday, he was surprised by the “bread and wine.” Our “bread” was typically broken saltine crackers; the wine was usually sweet grape juice. The bread was sent around first, passed up and down the pews in a tray for each person to take a piece. When everyone was served, the pastor said a blessing and the congregation ate the bread at the same time. The little glass cups (that really do resemble a miniature jigger) were assembled in a large round tray especially made for the purpose. Each tray held 25 or so cups and was sent up and down the pews by the ushers. We took the cup and held it until everyone was served. After a blessing, the entire congregation tilted their head and drank at the same time. 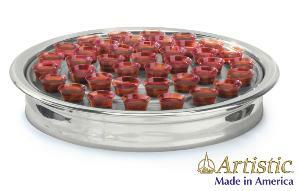 The little cups were placed in the special hole on the hymn rack and collected later by the ushers. When we said we were “going to Church” we might mean any number of things. We could be attending a Sunday Morning Worship Service, but we might also be washing cars with the teen group or participating in some other activity held on the church property. Catholics, I’ve noticed, don’t so much “go to Church” as they “go to Mass.” It’s very clear there will be no car washing, no lunching, no meeting when Mass is mentioned. Other activities may occur at the Church, Parish, or Pastoral Center, but Mass is Mass. Now, on Sundays I am honored to go to Mass at St. Andrew Parish in Pasadena, and frequently attend meetings and events at the Parish, but when I visit my parents I do enjoy joining them as we all go to Church. 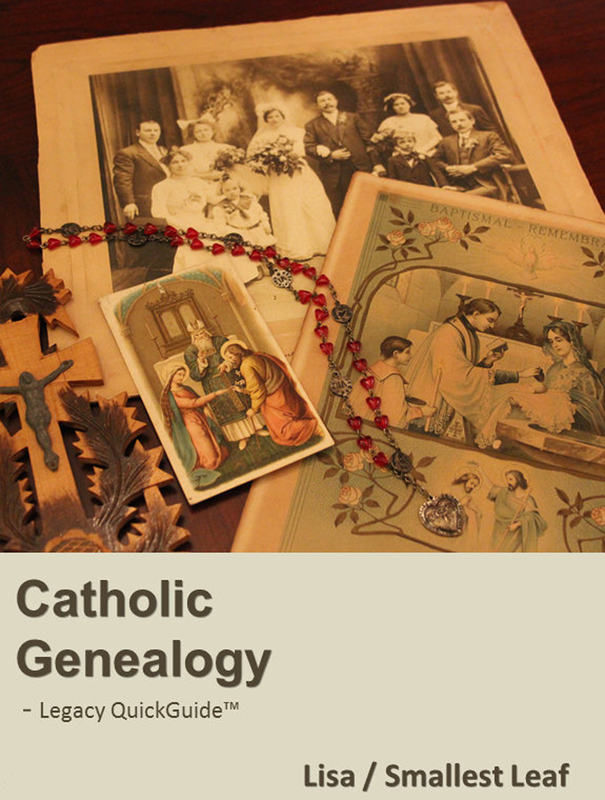 If you suspect a few Protestants in your family tree, watch letters and documents for use of give-away vocabulary: Church instead of Mass, Pastor rather than Priest, and Communion instead of Eucharist.